This page provides a high-level overview of Archivematica’s technical architecture. For more information, see Micro-services. The web dashboard allow users to process, monitor and control the Archivematica workflow processes. It is developed using Python-based Django MVC framework. The Dashboard provides a multi-user interface that will report on the status of system events and make it simpler to control and trigger specific micro-services. This interface allows users to easily add or edit metadata, coordinate AIP and DIP storage and provide preservation planning information. Notifications include error reports, monitoring of MCP tasks and manual approvals in the workflow. For more information, see Web-based dashboard. Archivematica maintains the original format of all ingested files to support migration and emulation strategies. However, the primary preservation strategy is to normalize files to preservation and access formats upon ingest. Archivematica groups file formats into format policies (e.g. text, audio, video, raster image, vector image, etc.). Archivematica’s preservation formats must all be open standards. Additionally, the choice of formats is based on community best practices, availability of free and open-source normalization tools, and an analysis of the significant characteristics for each media type. The choice of access formats is based largely on the ubiquity of web-based viewers for the file format. Since the 1.0 production release, Archivematica format policies have been moved to a structured, online format policy registry (FPR) that brings together format identification information with significant characteristic analysis, risk assessments and normalization tool information to arrive at default preservation format and access format policies for Archivematica. For more information, see Format Policy Registry (FPR). 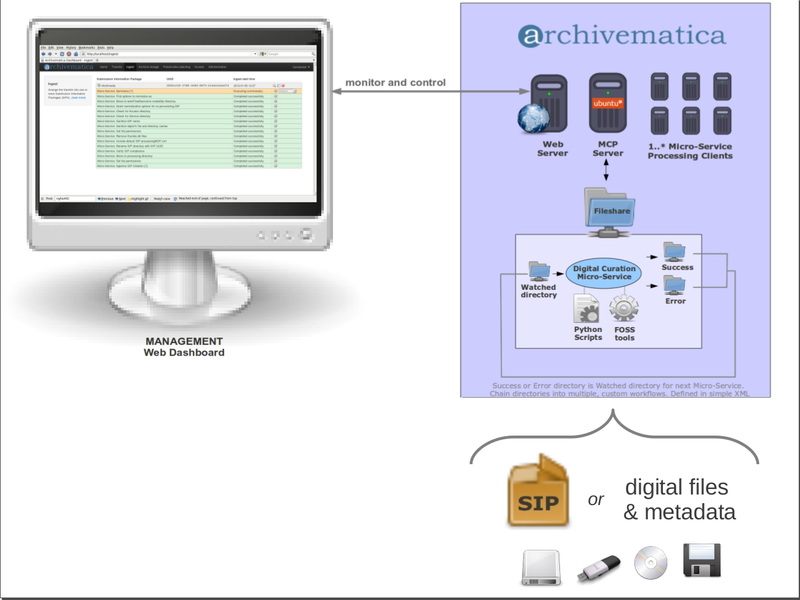 The primary function of Archivematica is to process digital transfers (accessioned digital objects), turn them into SIPs, apply format policies and create high-quality, repository-independent Archival Information Packages (AIP) using METS, PREMIS and Bagit. Archivematica is bundled with AtoM but is designed to upload Dissemination Information Packages (DIP), containing descriptive metadata and web-ready access copies, to any access system (e.g. Dspace, ContentDM, etc.). Using the latest in virtualization technology, each release of the Archivematica system packages a customized Xubuntu environment as a virtual appliance, making it possible to run on top of any consumer-grade hardware and operating system. This means the entire suite of digital preservation tools is now available from one simple installation. Archivematica can also be installed directly on dedicated hardware via its own Ubuntu repository. Its client/server processing architecture allows it to be deployed in multi-node, distributed processing configurations to support large-scale, resource- intensive production environments.